And I don’t mean that metaphorically. I saw a blog post a while back about grilled beef heart, which emboldened me to try heart if I got the chance. As luck would have it, I did. Nature’s Harmony Farm had some odds and ends for sale as add-ons to the monthly CSA so I decided to go for it. Honestly, the heart sat in my deep freeze for a long time. It was big. It was scary-looking. It was kind of funky. But eventually the guilt got to me and I put it in the fridge to thaw. In the mean time, I searched out some recipes calling for heart. 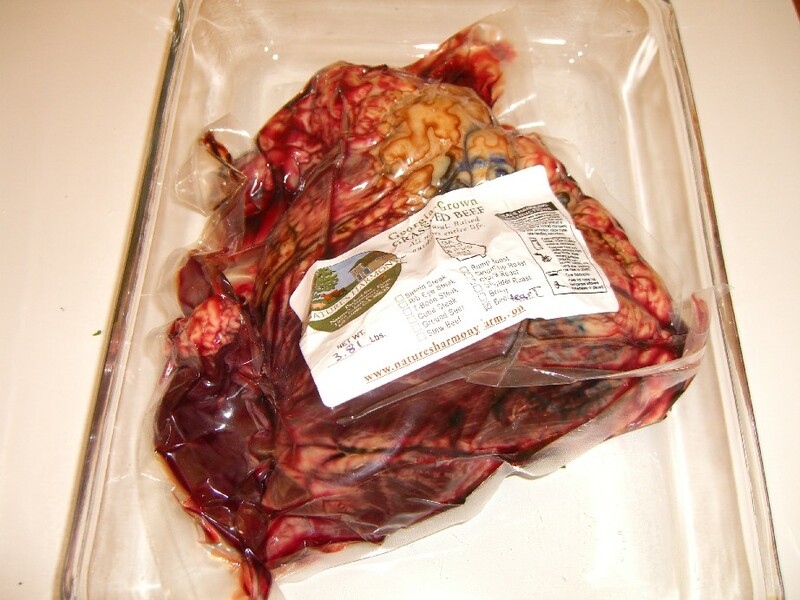 I settled on Beef Heart Braised in Red Wine . It called for wine, after all, how bad could it be? With much trepidation, I removed the heart from the package and stared at it for a while. It was kind of like a train wreck, grotesque yet I couldn’t look away. How the heck am I going to cut up this monstrosity, I wondered. The recipe said to trim off excess fat and – um – arteries. There didn’t seem to be much for arteries left on my heart, but there was a ton of fat. I felt kind of bad cutting off all that good pastured fat, but I was following the recipe and catering to test subject Bill, who doesn’t like to see or bite into a whole lot of fat. 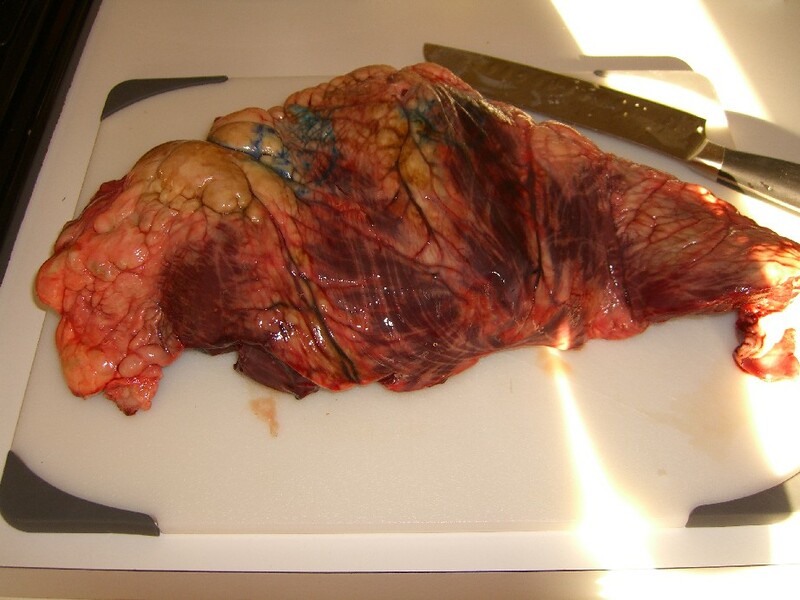 I trimmed and trimmed and trimmed until I was satisfied, then as the recipe called for, I cut the heart in half, then sliced it. In case I forgot exactly what I was cutting up, I sliced through a portion that looked like a bunch of small arteries. That was kind of cool, in a Discovery Channel kind of way. I dredged the heart pieces in flour and into a buttered frying pan they went. The recipe said that they should fry for 30-45 second per side, but I couldn’t even fit all the pieces in the pan at one time so I worked as fast as I could. 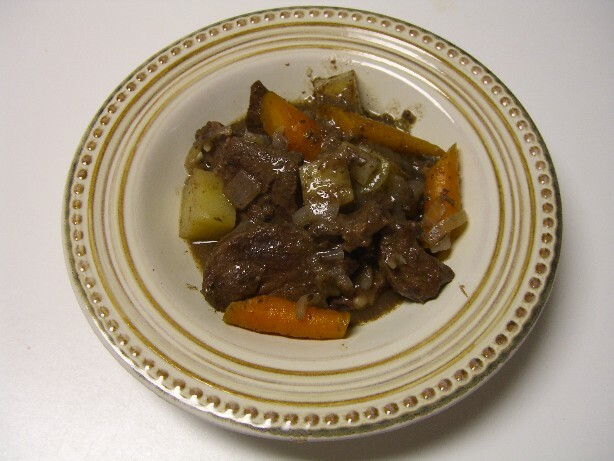 Using my homemade beef stock and CSA box carrots, I added the rest of the ingredients and left it to simmer. It smelled fantastic! So glad to see you’re back to having time to blog – I very much enjoy reading about your culinary adventures! 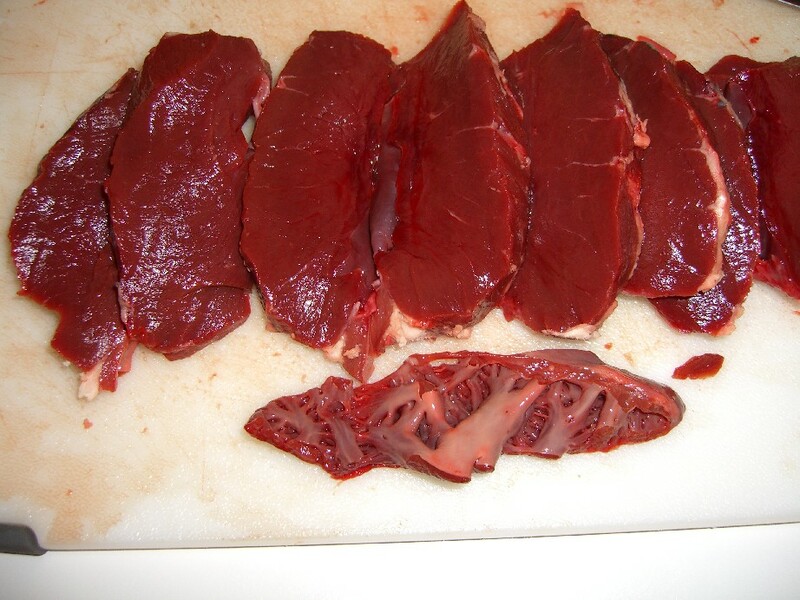 I have cooked two of the Nature’s Harmony Farm beef hearts so far, and another is in the freezer. So, the next one I cooked I did something completely different. I got a store bought marinade…(I know, I usually make my own, but years ago a friend who worked in New Mexico on contract came back with Claude’s Fajita Marinade from Santa Fe. He’d come back with cases of the stuff, but I could never find it since we moved to the ATL area. Kroger now carries it and I couldn’t be happier). 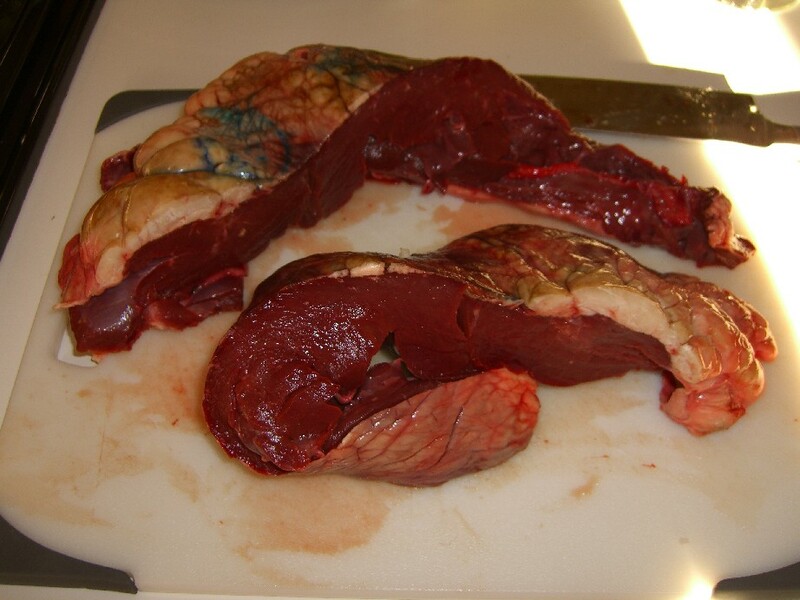 So, I trimmed the heart, cut it into 4 six ounce chunks and marinated it overnight in Claude’s. Then I put it on a hot grill till it was just medium-medium rare. I treated it like a skirt steak and sliced it thinly to put on a steak salad. This method was far better that trying to cook the life out of the heart. Tender, great flavor (you could taste the beef really well) and then the smoky spicy marinade to top it off. Next time I make heart, this is the way I’ll do it. Grill m-r, serve sliced thin, and maybe a ginger-garlic-pepper-soy-mirin marinade. I’m cooking my Nature’s Harmony goose this weekend. Wish me luck! Andy, that sounds really good! If I get another one I will try that. Thanks for sharing and good luck with the goose! BTW, Leslie sent me the original post. Thanks Leslie! Looks delicious! There’s a old-timey-style organic butcher by my apartment that sells all types of less commonly used cuts, and this may very well have inspired me to finally go over there and start adventuring. If heart is like other tougher cuts of meat (flank, chuck, shoulder, etc, etc), then it’s possible that you’d need to have it simmer on super low heat for longer than that recipe dictates in order to make them more tender, more like 1.5-2hrs.